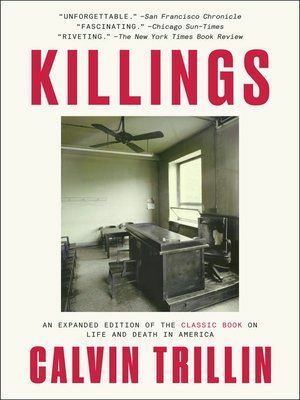 The author, a longtime writer for The New Yorker, spent years traveling the country and chronicling American life, sometimes uncovering riveting tales of murder and mayhem. Murder is as American as apple pie and motherhood. In 2015, according to the FBI, there were more than 15,000 murders in the United States. Calvin Trillin would not be surprised. First published in 1984, the book was out of print for years, forcing true Trillin aficionados to scour used-book stores in search of the volume. The newly released edition contains half a dozen additional pieces written since the original publication. The stories, each riveting in its own way, are like passing a particularly gruesome car wreck. You know you shouldn’t slow down to look, but you just can’t help it. “Right-of-Way” (new to this edition) tells the story of a property dispute between two strong-willed but very different women who move to Rappahannock County in the bucolic Virginia countryside. Rather than peace, they find each other. And death soon follows. “I’ve Got Problems” (also new) tells the tragic story of a standoff in Cairo, Nebraska, between Arthur Kirk and the Nebraska State Patrol SWAT team. The heavily armed Kirk, holed up in his home and surrounded by SWAT team members bristling with firearms, hung up on negotiators, explaining with perhaps unintended understatement, “I’ve got problems!” “The Mystery of Walter Bopp” recounts the disappearance of a health-store proprietor in Tucson, Arizona, who, on close inspection, had a deeper backstory than anyone might have imagined. But the best in this collection is the last essay, a classic by any measure. “Covering the Cops,” first published in 1986, is about Edna Buchanan, an iconic Miami Herald crime reporter and now a murder-mystery writer. As Trillin notes, there were police officers in Miami who said it wouldn’t be a homicide without her. Trillin is a superb writer, with a magical ability to turn even the most mundane detail into spellbinding wonder. Armed with this wealth of material, he utterly shines. Every piece here is a gem.